Every baby born at our local hospital, Cayuga Medical Center, receives a new sturdy board book at birth and information about reading to babies tucked into a red canvas book bag. Babies who are welcomed into a family through adoption or home birth can pick up a bag with books and materials at any library in the county. Since 2014, a partnership with area libraries has provided additional resources. Now families receive Baby’s First Library Card, a handout that lists 50 Board Books for Baby, and another book, Lola at the Library by Anna McQuinn, in a sturdy red bookbag, all to encourage reading to babies and provide more books for every family’s home. 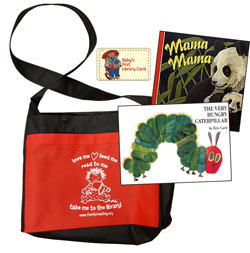 The Very Hungry Caterpillar by Eric Carle is a well-known story about growth and change. A caterpillar, depicted in bright, hand-colored paper collage, hatches from a tiny egg. After eating his way through the book (actually leaving holes in the pages!) he changes into a beautiful butterfly. As Eric Carle says, “Ultimately this story is about hope; every living thing will grow up, be beautiful, and unfold its talents.” The board version of this book is used as a gift to babies so that the book can be saved as a special memento from childhood. Parents have the choice of another book, Mama, Mama by Jean Marzollo for their baby, especially if an older sibling previously received “The Very Hungry Caterpillar.” This board book shows mother animals and their infants rendered in beautiful illustrations accompanied by simple text describing the loving ways parents interact with babies. This was our first community partnership around books. In 1995, when Family Reading Partnership founder Brigid Hubberman was working at federally funded family-wellness (WIC) sites through a local literacy program, she was struck by how easy it was to spot the children (even two-year-olds!) who had been read to beginning at birth. Wanting to get out the message that “it is never too early to start reading to babies,” she thought that a book could be given at birth from the hospital. This was not a new concept but, as often is the case, this great idea was incubating in many places around the United States at once. Other communities were giving out books at birth, and it was a project that our local hospital enthusiastically wanted to adopt, too. A local bank, the Tompkins Trust Company, has not only funded the book since the project’s inception, but thanks us for the opportunity to contribute to the community in such a meaningful way. The bookplate label that is placed inside of each book given to families acknowledges the partners in the project and personalizes the book. Volunteers put the bookplates in each book and deliver them with the red book bags to our hospital and libraries. Tompkins County Public Library provides funding for the book Lola at the Library and all of Tompkins County’s public libraries came together to provide all babies their own library card that can be used at any of the participating libraries, giving parents more reason to visit their local library as soon as their baby is welcomed into their family. Our role in this community literacy collaboration is ordering books, coordinating the preparation and delivery of books, and maintaining good lines of communication between the primary partners in the project. The many letters of thanks we receive each year from parents illustrate the impact this program has on creating a culture of literacy in our community. From a mother at WIC (nutrition program for low-income families): “When my daughter was born, we were given a book as a gift at the hospital. I honestly never thought that you would read to babies. I went out and got some more books right away. I really believe that she loves books so much today because we began at birth. The Family Reading Partnership is happy to have you replicate the Welcome Baby program. We only ask that you credit the Family Reading Partnership when possible. The concept for Baby’s First Library Card is based on the many programs across the country that are similar in promoting early library use. Family Reading Partnership partnered with its area libraries beginning in 2014 to support those county libraries in encouraging library use by families with babies.